A young Aycliffe Mum has been left paranoid and insecure after heartless thieves burgled her during the night while she and her one-year-old son were asleep. But brave Chloe Tailford says she would like to meet the depraved crooks who crept into her home during darkness – and ask them why they stole her son’s Christmas money jar. The 21-year-old student nurse is one of the many victims to suffer from a spate of recent burglaries in the town. She was asleep when it’s thought at least one suspect slinked into her house from the back garden. After taking Chloe’s bag – containing her purse, keys and important college work – and about £80 from her son’s festive savings, they made off before dumping what they didn’t need. But by sheer chance a local man walking his dog found some of the items and posted a picture of Chloe’s key-ring, which contained a picture of her, on Facebook at around 6.30am. Her mum, Claire Mudd (pictured above, right, with Chloe and Oliver) was alerted to it and phoned her daughter straight away. “My Mam called and wondered what the hell was going on,” Chloe told Aycliffe Today. “She asked if I was OK and I said ‘yeh, why?’. She told me about my keys and I knew straight away I must have been burgled, so I just panicked and ran straight into Oliver’s room to check he was OK.
“Thankfully he was, all the things that were taken can be replaced, but it’s just the inconvenience of it and the thought of someone being in the house while I was asleep. “It has made me paranoid and insecure. I changed the locks straight away and I have been worried on an evening. “I just don’t know why someone would do this. 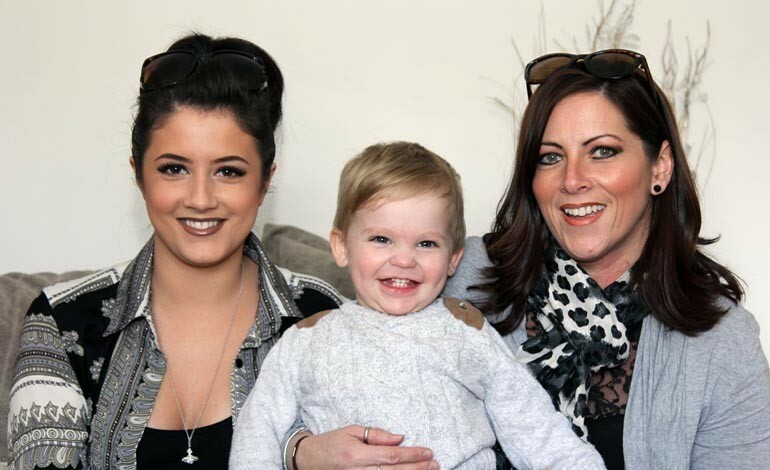 Former Woodham Academy pupil Chloe juggles her role as a full-time Mum with her nursing course at Bishop Auckland College, and plans to go to Teesside University later this year to continue her studies. Her Mum Claire, who has been a victim of burglary herself in the past, said: “She’s got a lot on her plate already and doesn’t need it. “It’s just the mindlessness of it – some of her things were returned but she lost some important college work which she had to do again. Chloe has praised the Newton Aycliffe Neighbourhood Police Team, who have been supporting her since the burglary which happened a couple of weeks ago. “They’ve been really good,” she said. “My Mam had to call them at first because I couldn’t compose myself, but they were here within half-an-hour. Now feeling much stronger, Chloe bravely added: “I want to see them, face to face, and ask them, why? “I had gone to bed early that night as I didn’t feel very well and totally forgot to lock the back door, but you just don’t expect this to happen in this area – it’s a nice area. “The police think there were three of them but they can’t be sure how many came into the house, but they were obviously going round trying door handles and mine wasn’t locked. “You never think it will happen to you. You see it being reported on social media and you just don’t think about it until it happens to you. Aycliffe NPT acting Inspector Mark Edwards regularly urges residents to be vigilant and keep their doors, garages and sheds locked at all times in his blog on Aycliffe Today. • Anyone who sees any suspicious activity or has any information about recent burglaries is asked to call police on 101.